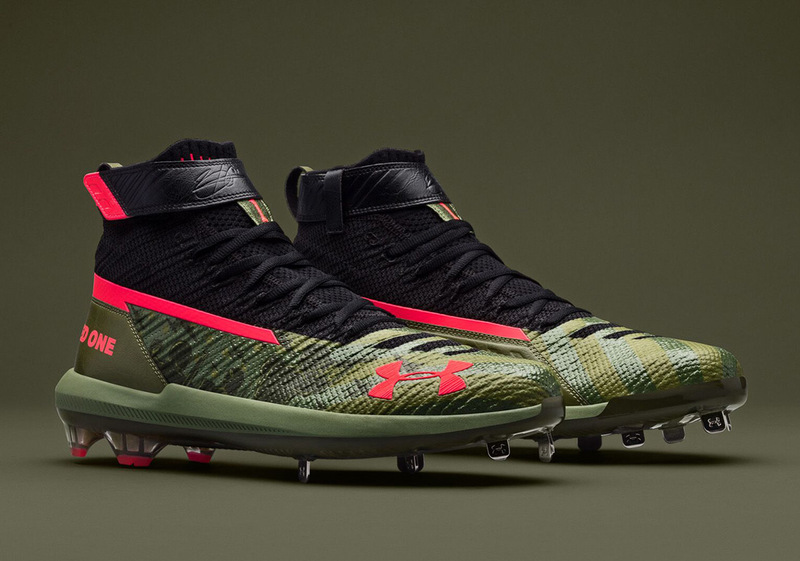 In honor of Memorial Day, Bryce Harper and Under Armour have teamed up for a collection of cleats for the 1st Infantry Division. Consisting of three different options, each selection comes adorned in a camouflage green with infrared detailing for an added pop of color. The 1st Infantry Division is the oldest continuously serving division in the US Army having just celebrated its 101st birthday. “Big Red One” can be seen throughout the collection serving as the Infantry Division’s monicker on either the heel or the tongue of each cleat. Mid and Low options of the brand new Harper 3 that is engineered specifically for Bryce’s needs will be available on UA.com this Fall. Enjoy a detailed look at the three Memorial Day cleat options below and look for your favorite UA baseball athletes to be wearing them on Monday.